All too easily travel with bikes is forgotten. Weekend playtime, often destined for so many things, too easily evaporates into a short ride from the front door. If you’re lucky, maybe you can drive to something a little further out on a Sunday morning. But most of the time, you end up on your local trails, those same corners, that steep bit that scares you when it’s wet, and that same gap jump you can’t hit no matter how many times you run into it. Don’t get me wrong: I LOVE local trails–that’s what makes mountain biking so easily accessible and provides that boost of happiness after a long day in the office, turning the worst days into the best. But there is something more to mountain biking that early pioneers such as Charlie Kelly, Joe Breeze, and Gary Fisher were searching for. It was the sense of exploration, and that tingly feeling you get when riding a new trail, that drove them up into the hills in the late 70s. It is that very same sense of adventure that these days drives some lucky people to travel abroad to ride their bikes in new places, and what motivated me to travel to the other side of the world to explore the island paradise of New Zealand. 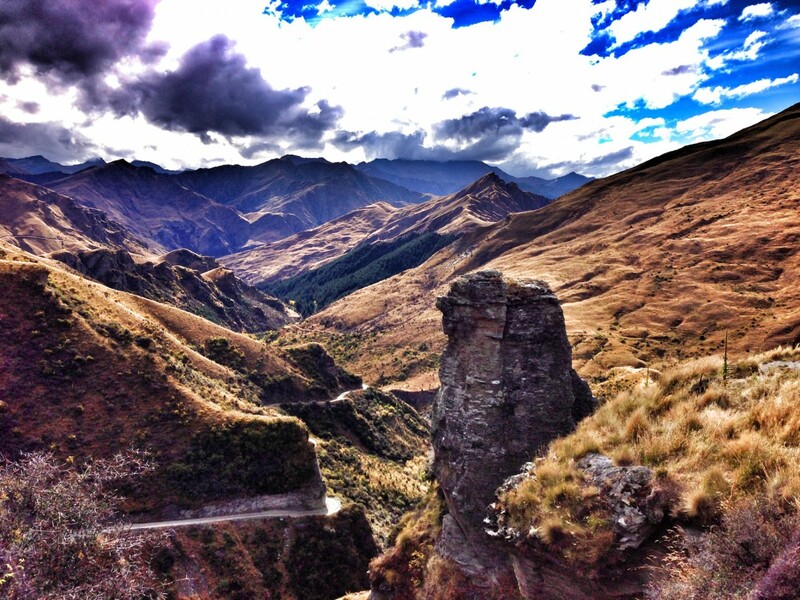 By now everyone’s heard about Queenstown, and more recently Rotorua, but you’d be forgiven for thinking those were the only two places in New Zealand to ride bikes. 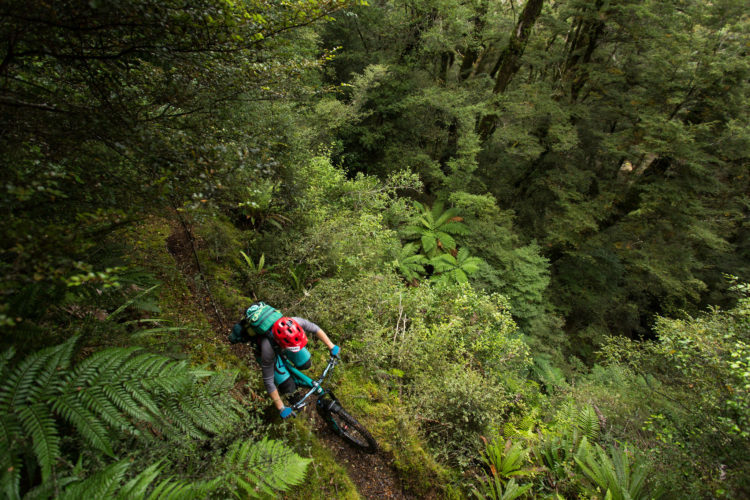 It seems that Kiwis are exceptionally good at keeping secrets about their other trails. It’s debatable what makes these trails so special: the amazing dirt, the perfectly-sculpted ribbons of singletrack, or the untouched native flora and fauna. All you need to know is that they are up there with some of the best trails in the world. 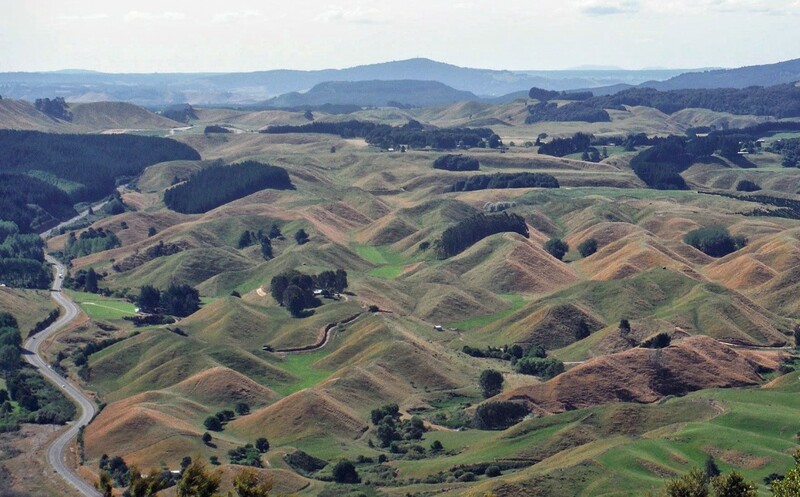 Our local guides had suggested that a good place to start was central North Island. Sitting at the center of the world’s second largest caldera, Taupo’s landscape is defined by a wild volcanic theme that gives it a unique feel. In fact, there are still five active volcanoes situated in the local area, one of the most impressive being Mount Ngauruhoe–or as you’ll know it, Mount Doom from Lord of the Rings. 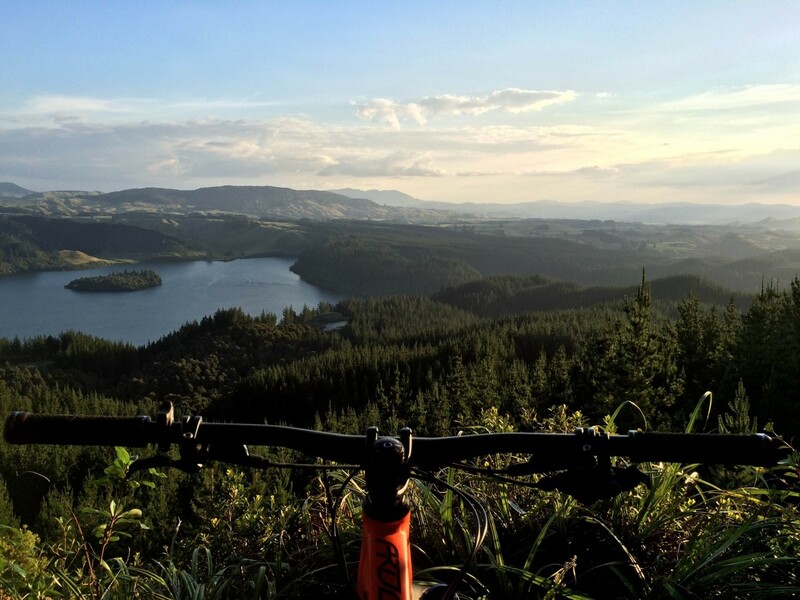 The wealth of riding in the area is immense: all differing styles, from the flowing singletrack of K2K that loops the side of Lake Taupo, to the technical, natural, and native Te Iringa trail. 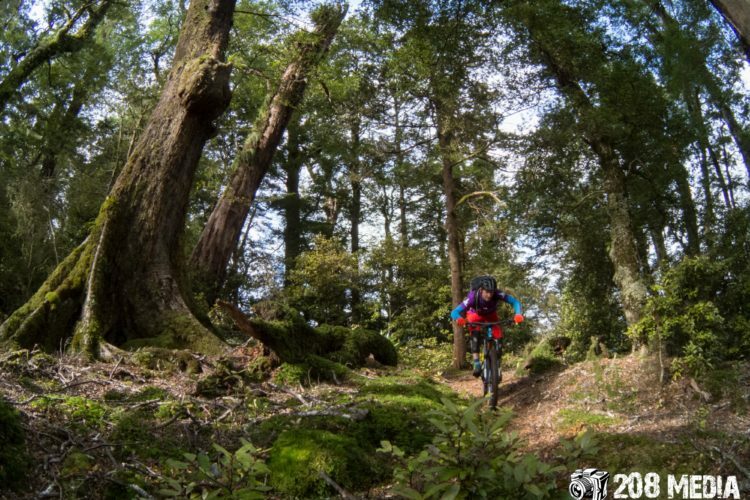 The K2K trail features fast, swoopy singletrack that contours around the side of Lake Taupo–one of those trails that everyone can ride–but when ridden fast, a whole plethora of new lines, jumps, and wall rides being to present themselves. Yielding some amazing views over the pristine lake, the real gem is the boat shuttle mid-ride. On the hottest summer days, a swim in the crystal clear lake, so clean you can drink it, is undeniably wonderful. 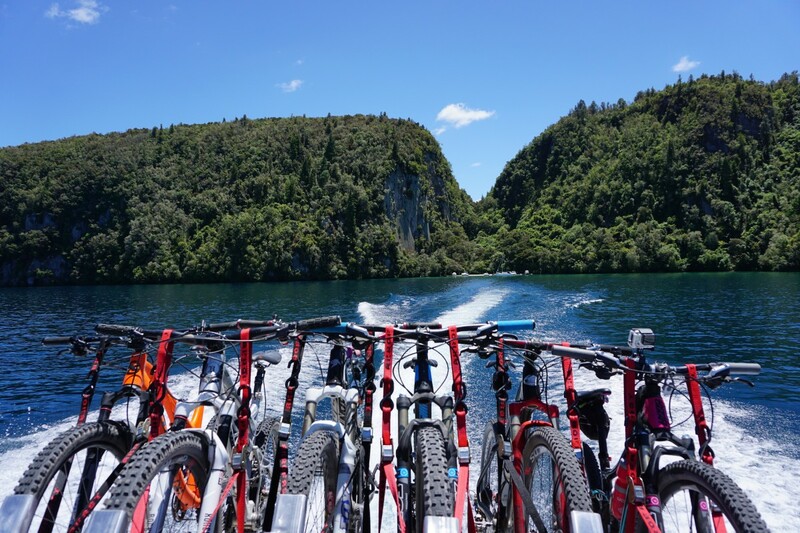 The boat ride, initially originated as a section of the trail, is currently under land negotiations, and is a great way to switch perspective and see New Zealand from the water. View from the boat shuttle, looking back to the private bay the trail drops into. Moving 45 minutes east, the landscape changes from volcanic to dense, ancient Jurassic Park-like forest. A complete contrast to the flow and speed of K2K, Te Iringa is a technical and natural wonderland. Large fingers of roots feed across the trail, escaping the mother tree, holding together the loamy beech forest soil that provides sought-after hero dirt! 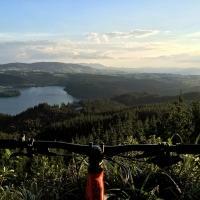 Although Te Iringa is currently an out-and-back ride, the trail somehow seems completely new on the way back down. Those sections, critically assessed for line choice on the climb, are all but forgotten as you rip through natural feature after natural feature on what feels like a magic carpet ride back down. Giant ferns, prehistoric trees and colorful plant life whips by as you descend, giving that feeling of Mach 4. But that moment you get too excited, go over the bars, and find yourself laid flat out on a bank listening to silence all around for what seems hours, you realize this is a true middle-of-nowhere backcountry gem. Next stop featured a visit to the coastal town and emerging mountain bike paradise of Whangamata. Access is either from the north or south via 40km of the windiest New Zealand roads, which had us wanting a rally car over the Ford Ranger. The forest itself is a working plantation, with building rights recently given to the local club. The trail builders have done exceptionally well over the last couple of years, putting in well over 20 trails, a mix of bikepark-style jump trails, flow trails, and natural hiking trails. 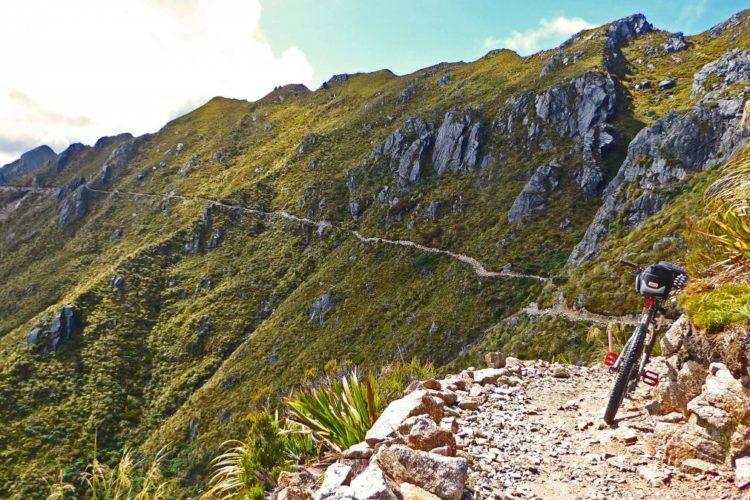 Although it doesn’t have the ancient forest of Te Iringa, the Bullock Track is the jewel in the crown and definitely the best bit of backcountry in the area. An old track used by miners to access the Luck-At-Last Mine, the trail heads out into the hills, winding around old disused mines and waterfalls, finishing up somewhere outside of the mountain bike park. With roots, hidden rocks, and exposure, it’s one of those trails where riding well within your ability is wise, as it’s a decent pedal back to civilization… but certainly worth the effort for the fantastic natural riding. The beauty of Whanagamata is a pristine sandy beach located 5 minutes from the trails–a well-renowned surf spot, but also good for a swim, beer and BBQ. It is a definite draw to the area and a great way to relax post ride. We couldn’t finish the trip without dropping into Rotorua. 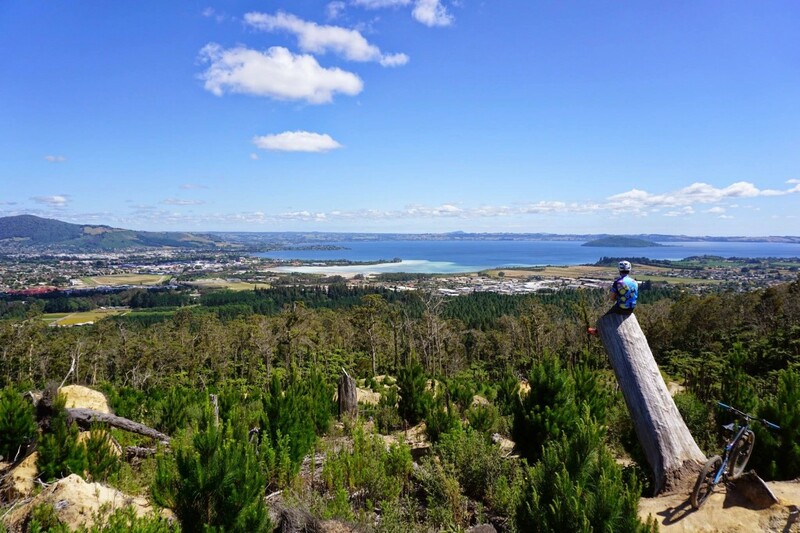 Home to one of two Skyline gondola-accessed bike parks in New Zealand, there is a lot going on in Rotorua right now. 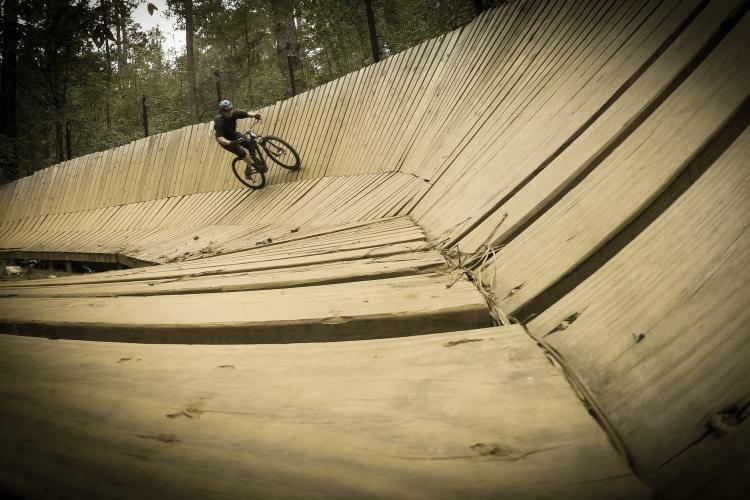 But dig a little deeper and you’ll uncover a wealth of world class riding outside of the bike park. Rotorua’s Whakarewarewa forest is accessible by a shuttle bus service, and although not a bike park (I see it more as an enduro forest), too many people get caught up on the main trails and lapping the shuttle. 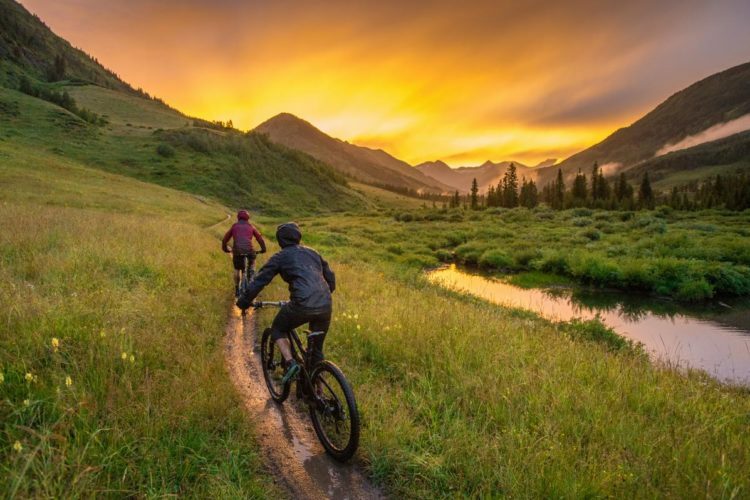 Out in the backcountry there are some trails that require a bit of effort–maybe 20 minutes of pedaling–but you’re handsomely rewarded. 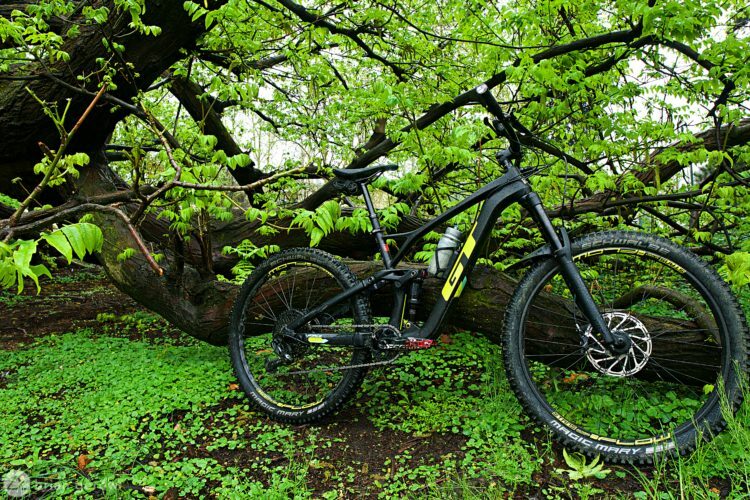 Newly-built trails such as Kataore, a black diamond monster of loamy roots, high lines, and steep, committed corners, and Kung Fu Walrus, its mellower younger sibling, take you out to the quiet parts of the forest. Southstar Shuttle’s latest conception, Eagle Vs Shark, is an amazing intermediate trail, yet will give the fastest and slowest riders alike a real buzz. Benchcut singletrack with small table tops, blind corners and small berms traverse all the way down the hillside, with the opportunity for the more advanced riders to take some “advanced enduro race lines” off the piste. Make a short trip out of the forest and the smorgasbord continues. We were lucky enough to ride Rainbow Mountain, a decent hour’s pedal and push up revealing a hilltop with a scenic view and sights of the surrounding caldera, 40km in each direction. 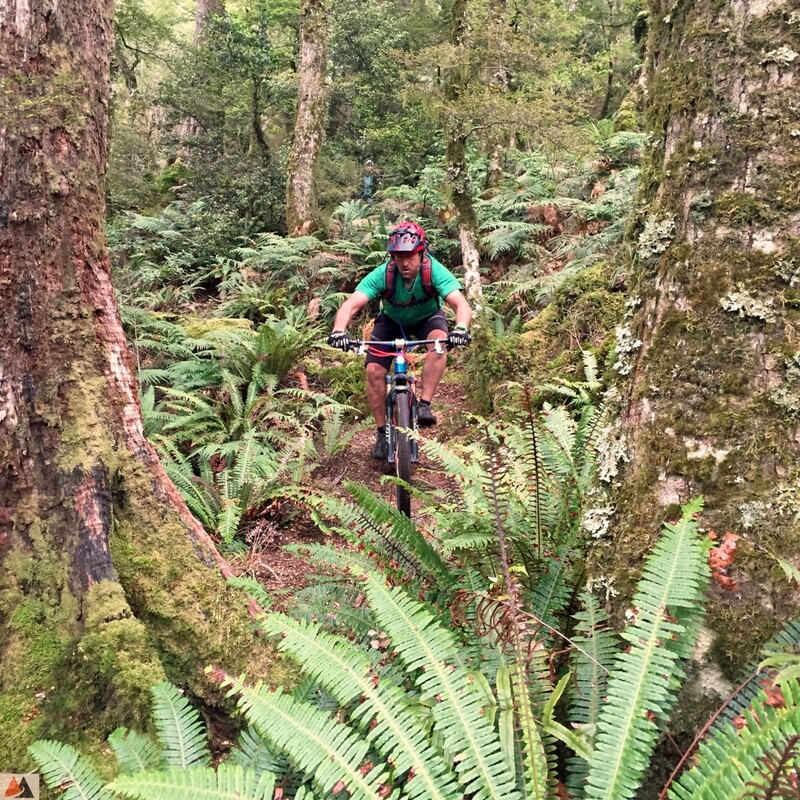 The descent is a trilogy of differing trails: steep drop offs over root gardens under the cover of native bush turns into a bobsled run for bikes. Perfectly placed trees and leaf litter make you feel like a hero pushing into the natural banking. At the bottom, flatter corners covered in a thick layer of dust and sediment, lined by giant ferns, allow you some drifting practice and a soft crash pad when things go wrong. Caldera on the horizon and Toblerone mountains, center, caused by a volcano eruption causing shock waves to run through the earth. So would I recommend riding in New Zealand? Absolutely! But make sure you don’t take the easy option of shuttles and bike parks. As backcountry skiers say, “earn your turns” — it certainly rings true here! Pedal, sweat, make it hurt, and you’ll be rewarded by a ride you’ll never forget. 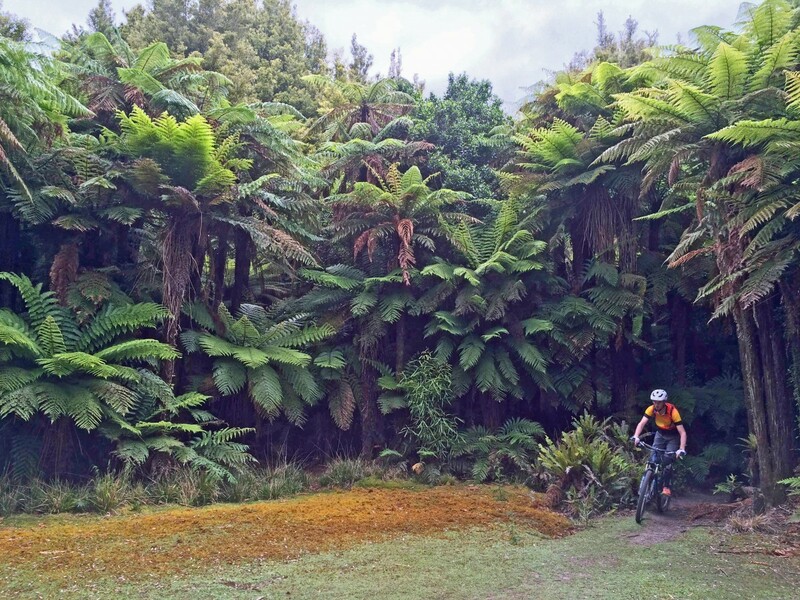 We were lucky enough to ride New Zealand’s North Island with JustMTB on their Native North tour. 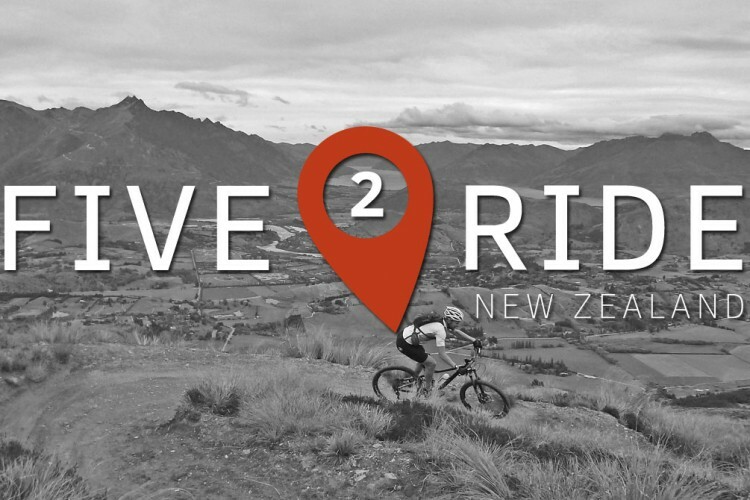 For tour info and dates visit www.justmtb.co.nz. Stu Lill was born and raised in London, but soon learned that he wasn’t made for city life. He moved out into the deepest Welsh valleys to learn to ride, and then moved to Wales, and then Chamonix. Since then he’s guided in Whistler, France, New Zealand, and many more places. Hey Stu, or anyone else, do you have any suggestions for backcountry rides on the South Island? My wife and I are going to New Zealand this April or May to celebrate our 30th anniversary (this past December). She’s not a biker, so I’ll only get a couple of shots at riding. I would love to do one backcountry ride any where between 20-60km. Could be a loop or a shuttle. I just want to once experience backcountry in NZ and be out of tourist setting for a day aaaand nail a couple of long downhills. We did a condo swap and have condo in Wanaka for a week, so that is our main base. But we are happy to venture out far from there. I’ll probably not bring my bike, so I’ll need to rent a bike too. Thoughts anyone??? The Kennett brothers from New Zealand bike toured through Fairfax, California in the early 1980s. They brought home with them the mountain bike bug, and pioneered mountain biking in Kiwiland. Any trip there should start with a visit to their website, where they have collected 30 years of their NZ experience.